Actor, performer, and radio show host Joe Piscopo visited Liberty University on Friday, taking the Convocation stage for an inspirational discussion and a lively musical performance. The Saturday Night Live alumnus gave the event a late-night spin, sharing his music and comedy with the crowd of over 10,000 students in the Vines Center. As an entertainer, Piscopo has worked on stage and in film, with all the charisma and vocal chops of a swing-era crooner. Joined on stage by Falwell and Nasser, Piscopo talked about the importance of family and civility. 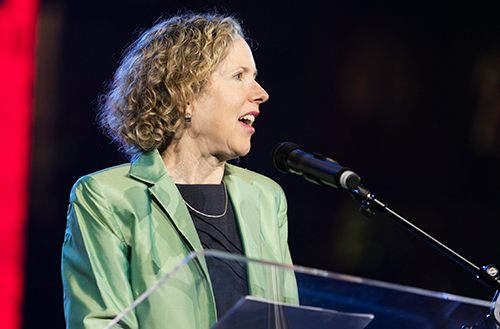 Falwell introduced award-winning writer, best-selling author, and political commentator Heather Mac Donald. She thanked Liberty for the warm welcome and attentive ears, which she said was counter to her experiences at other institutions where she has faced rude treatment, from inappropriate gestures to walkouts and blockades, before even getting a chance to speak. Her rapid-fire message focused on the dangers of identity politics and victim culture. She noted examples from several universities, including Ivy League campuses, that exemplified a culture where professors are chided for exams that are “too fact based” and merit, even in scientific research, takes a back seat to an agenda. 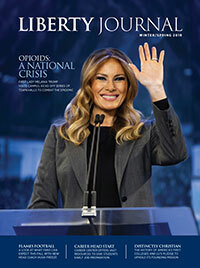 “If we are going to restore sanity and civil harmony we are going to have to take on the victimology narrative directly and assert that for all of our historical flaws — and they were real — there has never been a more tolerant, opportunity filled polity than our current one,” Mac Donald said. She added that we can’t sacrifice the preservation of knowledge or deny the accomplishments of history, even in light of the cultural problems past societies may have had. Lynchburg Mayor Treney Tweedy closed out the event by commissioning “Serve Lynchburg,” a massive, two-day humanitarian blitz where approximately 2,000 Liberty students will tackle a number of service projects throughout the community.